The gunman was recently fired from a business in Orlando. The suspect shot former colleagues Monday. Authorities are calling the entire incident a workplace violence incident. 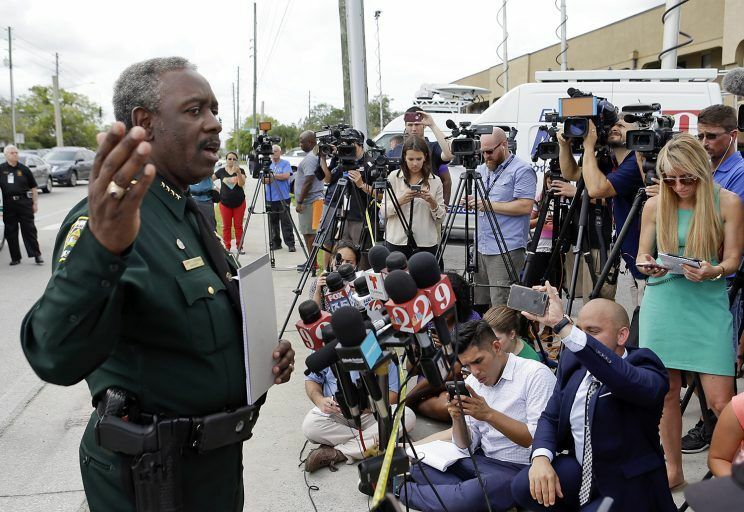 Jerry L. Demings, who is an Orange County Sheriff identified the shooter as a 45-year-old Robert Neumann Jr. The suspect singled out employees at Fiamma, which is a business that manufacturers accessories for recreational vehicles and the business are located just seven miles from downtown Orlando. The weapons have been said to be a semi-automatic handgun, a hunting knife and according to authorities possibly some smaller knives. The victims are Kevin Clark, 53 Jefferey Roberts, 57 Robert Synder, 69 Brenda Montanezo-Crespo, 44. The fifth victim according to The Associated Press is Kevin Lawnson, 46. Demings mentioned that at least eight other people inside the building were not injured in the attack. Deputies received the 911 call around 8 am and the caller claim there was a shooter. The shooter entered the building through a rear door and came across the first person he saw. That employee was spared and only had a gun pointed at her and was told to get out before the shooting began. Police also say that the suspect reloaded his weapon at least one time before the entire incident ended. Sheriffs say that Neumann was fired from Fiamma in April but did not say why he was fired. Demings did recall that around three years ago, officers responded to a call at Fiamma where the current suspect was accused of battering another employee. However, at that particular time, no charges were ever filed. The officers said that it appears as if Neumann did not have a concealed carry permit and had a past criminal history or Marijuana possession, and a DUI. However, in 1999 the suspect was dishonorably discharged from the army. Shelly Adams has a sister that works at the business and when the whole incident began she was in the restroom. She heard a band and when she exited the restroom she saw someone on the floor. Jennifer Blevings saw the news after the shooting had happened and “her heart sank.” the Orlando Sentinel reported that the said she had not been able to reach her father, Synder who at the time was at Fiamma. She then found out her father had been killed. The FBI dispatched some members from their Orlando office to help in the investigation. They’re trying to determine the motivation of it all. Authorities did not say if they knew what they motive was yet.